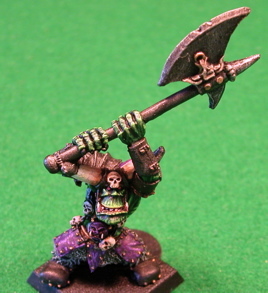 This is an old OOP GW Black Ork. The model is lead and was bought in England by my aunt. It was painted finally to be part of my Mordheim gang. Since I never intended to have any Black Orks in my fantasy army, not even a single character model this guy will probably serve as a Champion or Big Boss or just stay in my miniature case. I think I painted the other guy that came in the blister too, I have a Black Ork command blister too I think.